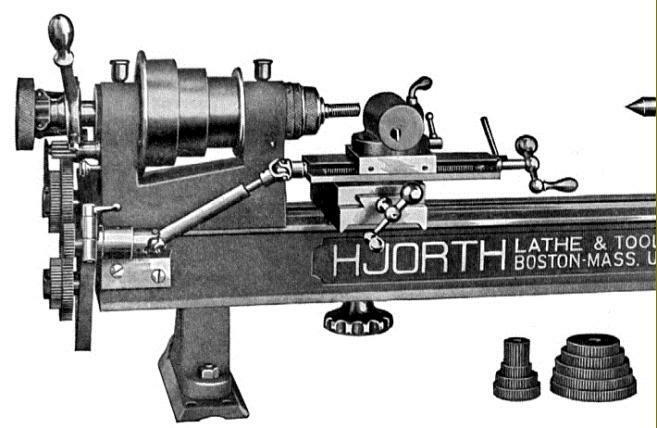 Mr. Henrick J. Hjorth had his Hjorth Lathe & Tool Company works at Woburn, Massachusetts in the USA (with the registered office at 27 School Street, Boston) and produced a range of what were known, in their day, as "Bench Lathes". However, today we have to add the word "Precision" to that description, if we are to understand the meaning of the phrase as understood in the late part of the nineteenth and early part of the twentieth centuries. Pictured above, the screwcutting version of the lathe though based was on a 1911 patent was still available in much the same form in early 1930s. The capacity was 18" between centres and the swing 83/4"; the bed was 36" long and the machine weighed, with basic equipment, 143 lbs. Spindle speeds depended upon the precise countershaft specified but were normally arranged to be 1000 r.p.m. on top speed and 500 rpm on bottom. While not shown on the lathe above, a backgear assembly was offered to reduce the speeds sufficiently for safe screwcutting which, on the Hjorth was transmitted to the top slide through a universal-joined shaft - a not uncommon method on early precision bench lathes. 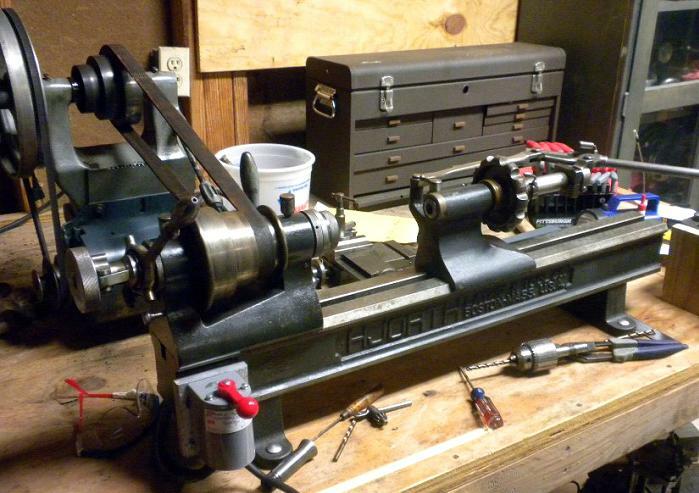 As a small aid to user-convenience, the mounting plates beneath the lathe feet were slotted, to allow a modicum of adjustment for belt tensioning. The compound slide rest, with a 51/2" top movement and a 41/2" cross movement, was topped by an eccentric toolpost very similar to that found on Rivett lathes. So far, three headstock spindle nose fittings have been discovered: one taking a 4NS collet; another what might have been a 5NS collet, a fitting the same diameter as the common 5C but longer at 4.75" together with a different angle on the end and one ground to accept Hendey No 2 collets and equipped with the correct Hjorth-manufactures drawbar. Both the spindle, with a 3/4" through bore, and the tailstock were fitted with a Brown and Sharpe No. 6 taper, 21/2" long. One of the optional tailstocks was very unusual in being fitted with a combination screw and lever-feed actions; the screw feed had a maximum travel of 23/4" and the lever feed 41/4". One odd but most useful feature on the Hjorth was the use of separate mounting pads under each bed foot. These were fitted with screw adjusters, mounted at the rear, that allowed the lathe to be moved forwards slightly to compensate for belt stretch. 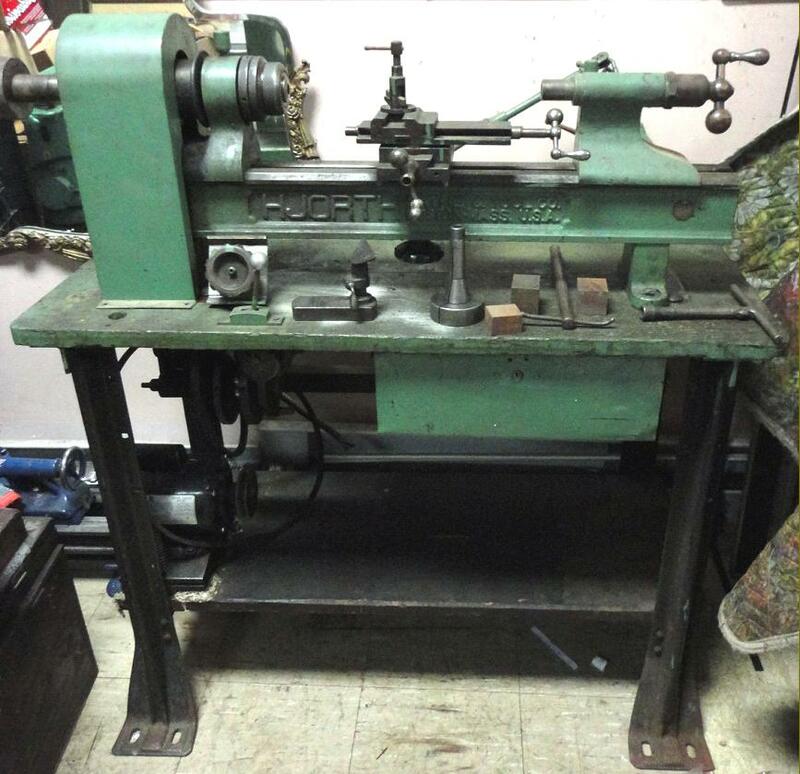 As was usual with this class of lathe, a host of other special accessories was available including a remarkable bed-mounted combination vertical milling, gear-cutting and dividing attachment; some examples of these accessories can be seen on the accompanying pages. Unfortunately, as with most makes of precision bench lathe, Hjorth accessories are hard to find - few having been sold in comparison with the number of lathes manufactured. Other makers of similar lathes in the USA included: Levin, Bottum, American Watch Tool Company, Bausch & Lomb, B.C.Ames, Cataract, Crystal Lakes, Derbyshire, Elgin, Hardinge, Hjorth, W.H.Nichols, Potter, Pratt & Whitney, Remington, Rivett, Sloan & Chace, U.N.D., Van Norman, Wade, Waltham Machine Works, and (though now very rare) , Frederick Pearce, Ballou & Whitcombe, Sawyer Watch Tool Co., Engineering Appliances, Fenn-Sadler, and the "Cosa Corporation of New York". A list of manufactures of similar lathes can be found here.. Although the Hjorth would normally have been supplied as a plain-turning lathe, with a simple tip-up tool rest, this comprehensive screwcutting attachment was produced to drive the top slide of the optional compound slide assembly. The tumble reverse (A) was driven by a gear (B) that slid onto the end of the headstock spindle. The tumble-reverse assembly, and its method of engagement with a gear formed on the inside of the largest diameter of the headstock cone pulley, bears an unmistakable likeness to that employed on the Rivett 8-inch Precision lathe - even to the thin, spring-steel engagement "lever". Fitted with its own bed base plate that incorporated a compound slide, this unit could be used in the conventional way, to impart a vertical motion to the workpiece or, fitted with the dividing-gear bracket shown fastened to the end of the bed, made to cut racks. A simple dividing head and quill was also available, as shown below. Component parts of the Milling Attachment. The Standard Vertical Milling Attachment, carrying a pawl-operated indexing unit and shown here combined with the Universal Milling Attachment. Hjorth Universal Grinding Attachment with screw-action cross feed and lever-action longitudinal feed. The centre bracket could be removed and replaced with the Internal Grinding Attachment shown below. Hjorth Internal 32,000 rpm Grinding Attachment. There were at least two different versions produced, one for use on lathes and another, almost identical, for use on plain or universal grinders. The variety illustrated had its own speed-increasing countershaft built on to the mounting bracket with the bearings supplied with oil from wick-feed lubricators. An unusual patented combination tailstock with screw and lever feeds. The dividing head fastened to the barrel was designed to hold rings that could be indexed round and bored through their edges by a drill held in the headstock chuck. Another use was to sharpen small saw blades by replacing the drill with a grinding wheel. The collet capacity was 5/8" with step chucks available to hold up to 21/2" in diameter. Lever-action tailstock with cross-feed slide. Just visible at the end of the main casting is a dividing plate, designed to assist in off-set drilling, tapping and indexing. The drill was held in the headstock and the workpiece in the 3-jaw chuck on the end of the tailstock barrel. Like the bearings it ran in, the 3/4" bore main shaft was made from tool steel, hardened, ground and hand lapped. The chuck-mounting threads were finish ground after hardening and the front bearing was of the two-angle type, with tapers of 3 and 45 degrees. Both bearings were fitted with four felt oiling grooves. The spindle-locking device was rather unusual - a spring-loaded plunger being allowed to impinge against a serrated ring.